Tibet, Tibetan Plateau, the ''Roof of the World'', are inhospitable but to wildlife it is a"paradise'': there more than 2,300 species of insects; 64 species of fish; 45 species of amphibians; 55 species of reptiles; 488 species of birds. To protect the wild animals, total about 18 nature reserve have been established, and five of them are national grade nature reserves in which rare and precious animals protected, :i. e., Qiangtang Nature Reserve for Wild Tibetan Yaks and Black necked cranes, Asses and Gazelles; Markam Nature Reserve for Yunnan Snub-nosed Monkeys; Shenzha Nature Reserve for Black necked Cranes; Nyingchi-Dongjug Nature Reserve for Antelopes; Riwoge-Chamoling Nature Reserve for Red Deer. 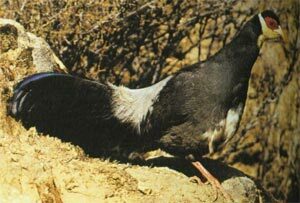 In Tibet, Snow Pigeon, Tibetan Pheasants, and Black necked cranes etc rare birds for you to watch. Following are the major sites to watch birds in Tibet. Yamdrok Tso Lake, is the 4 holy lakes in Tibetan Plateau, the largest fresh water lakes in Tibet, located on the way from Lhasa to Gyantse, is the largest home to many species of migratory birds in southern Tibet, and there are about 16 islands in the Yamdrok Lake, all the islands have become paradise for all types of birds. About 153 species of birds, the most are Anser indicus (Anser fabalis), L. brunnicephalus. It's about 130KM in length from the east to the west, bank lines about 250km, covers an area of 638 sq km, alt 4441m, the deepth about 20-40m, the deepest 60m.There are 16 birds islands, and the largest island about 8 sq km, the smallest about 3000 sq m, some of the islands are Seduo, Yongbuduo, Gemoriduo, Nayeduo etc. Some birds as Anser ndicus, L. brunnicephalus, Tibetan pheasants, Black necked cranes, Egretta garzetta, Mergus merganser, Aythya fuligula (Tufted Duck), Northern Shoveler (Anas clypeata) etc. The Black necked cranes fly here for wintering. The better time to watch birds about May, Jun, Jul, Oct, Nov.
Namtso Lake, the "Heaven Lake" is the 2nd largest salt lake in Tibet, situated at the edge of Qiangtang Plateay to the north of Lhasa, alt about 4719 meters, 70km from the east to the west, 30km from the north to the south, covers an area of 1940 sq km, inhabited by large flocks of birds both resident and migratory such as black lipped pikas, bar headed geese, black necked cranes and some other species of birds. Xiongse Monastery, located at Caina Village, Chushui County, the opposite of the river along the road from Lhasa to Gyantse, apart 30km from Lhasa, alt 4500m, founded in 1181, the largest nunnery in Tibet, average annul temperature 7.18D, the highest 29.4D, average annul rainfalls 441.9mm mainly in summer and aurumn. The rare and most birds is White esred pheasant (Crossoptilon, Tibetan pheasant), better time to watch them about May, also you can watch snow pigeon and other species of birds. Palgon Lake, Bangonghu in Chinese, about 155km in length from the west to the east, and width range from 40meters to 15km, the average deepth about 57meters, alt 4242m. 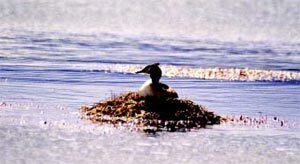 In lake there are at least 5 islands such as Shu Island, Tu Island etx, and one largest is Bird Island, about 300meters in length and 200meters in width, is the kingdom of birds, also breeding place in Spring for some birds such as Anser ndicus, some ducks etc back there in May and Jun, some island for special birds' habitat, such as Anser ndicus in Egg Island. 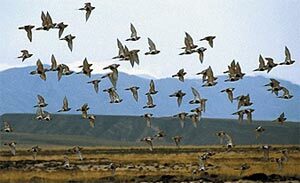 The better time to watch birds from May to Sep.
With an average attitude of 5000 meters, located in the north of Tibetan Plateau, covers an area of 2980HA, the area distributes all kinds of small and large lakes, and about 200 lakes (over 1 sq km lakes) in the area, and many species of animals such as wild yaks, Bharals, Tibetan wild donkeys, White-lipped deer, black necked cranes etc are being well protected in the area. The golden season is from June to September, during the temperature can reach 7-12ºC, rainfall from 50 to 300mm and mainly from Jul to Oct. There are 470 plants, about 92 species of birds. Covers an area of 40000 ha, locates around and from 31º38`N to 88º40`, alt 4562m, main protection are black necked cranes and wetland ecological system. Set up in 1993, there are many lake-basins belts, the temperature there just little high, the rainfall about 300mm annually, about 120 species of birds, and the rarest is Black Necked Cranes for its breeding area. 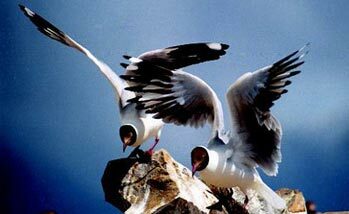 In this nature reserve, there is a lake name "Coe Lake or Tsoe Lake", investigated by China Scientists in Jun 2001, and a birds island in the lake, name "Sanglyrire Island" where 50000-54000 of Larus ichthyaetus (great black-headed or Pallas's gull) habitat three. This island apart from bank about 100m by boat, many nest there, about 2.52 nests per sq meters. Linzhou Pengbo Nature Reserve, another name Lhasa Nature Reserve, located at the south of Linzhou cunty, Lhasa River, alt 3800m, covers an area of 9680ha, valley grass land, wetland, human forests and agri-land, to protect the Black necked cranes and its habitat. 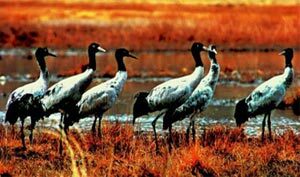 The black necked cranes fly here for wintering in Sep and Oct, and fly back to northern Tibet for breeding in Apr and May, resident black necked cranes here about 1520 birds, and about 3000 birds of cranes just over stop here and then to other places. With average depth of 5000 meters with its maximum 5382 meters, alt 750-4800m, located arond 29ºE. set up in 1984, and upgrade as national level protecting area in 2000, them main protecting objects are forests and rare animals and plants, covers an area of 62620 ha, it is a major Tibetan tropical ecosphere. In this nature reserve, there are 94 kinds of animals, over 160 kinds of birds, 38 kinds of reptiles, 17 kinds of amphibious animals, more than 1,980 types of insects, and some 3,000 plant varieties, 232 species of birds. Some birds are: Aceros nipalensis, Tragopan satyra, Tragopan temminckii, Psittacula alexandri, Aethopyga gouldiae, Aethopyga ignicauda, Leiothrix lutea, Chrysolophus amherstiae, Crossoptilon harmani, Black necked cranes.